The geometric pattern in this work is reminiscent of Native American textiles from the American Southwest, an area of the country that has influenced Davis's work. Parts of the pattern are obscured by other materials, as if layers of paint have been stripped off a wall to reveal the design beneath. Many of Davis's works incorporate crafts and patterns that he encountered in his travels and reflect the myriad cultural influences that have shaped his practice. 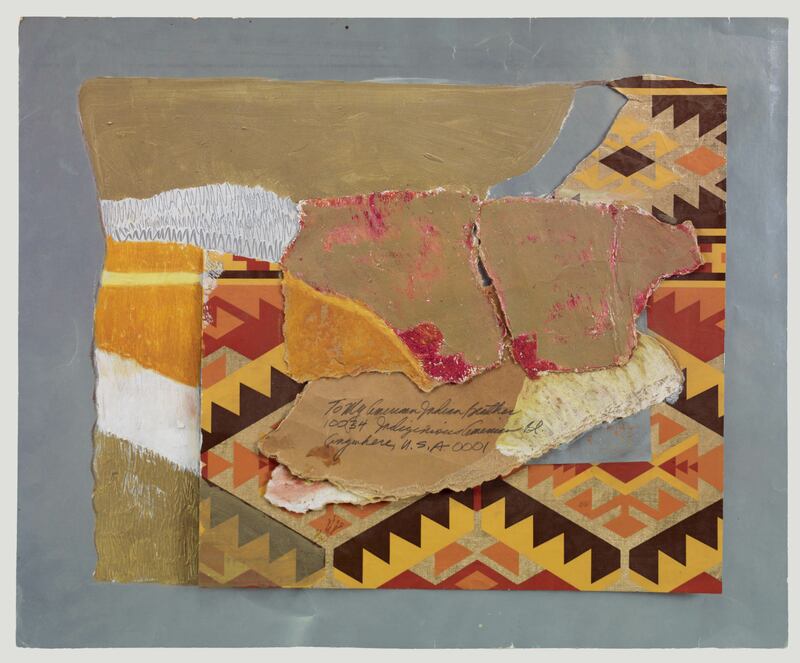 Commenting on the struggles of Native Americans for equal rights during this period, the work includes an element resembling a torn envelope, addressed as follows: "To My American Indian Brother / 10034 Indigenous American Blvd / Anywhere, U.S.A. 0001." "Untitled." Now Dig This! Art in Black Los Angeles, 1960–1980 Digital Archive. Los Angeles: Hammer Museum, 2016. https://hammer.ucla.edu/now-dig-this/art/untitled-davis.